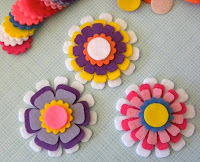 Kutz is a great resource for crafters looking for unique embellishments, but are short on time. As a scrapbooker, I love finding small items to enhance my layouts; however, I don't have the budget to purchase tons of die cutting machines. Kutz is the perfect solution for my dilemma. The owner, Cyn, offers a variety of die cut shapes made of felt, cardboard, and paper. You'll find multi-colored felt hearts that are perfect for a number of Valentine's Day craft projects. The big set of floral pieces (pictured) includes 120 mix & match pieces that will certainly come in handy while crafting. Cyn also offers larger pieces, such as the felt owl on branch, that are ready to spice up pillows, handbags & more. And the intricate felt butterfly & silhouette are simply beautiful. Visit Cyn's blog, Just-kutz, that features a great wreath tutorial. She also has another Etsy shop, CynContemporary, that offers handmade pillows & tote bags. I use KUTZ and love the high quality felt cutouts that Cyn offers. Also she is always innovating with new shapes and colors!! !